Late to the start, again! Got there when riders were starting to roll. For some odd reason all riders were riding on the west side of the bridge instead of the East. Bryan C told me Rob (our RBA) had asked riders to do so but I wondered why. The Bridge crew is notorious for forgetting to remove the signs that announce "No bikes beyond this point" all the time. Anyway since I was already late and in the back of the pack I did as everybody else and rode on the West side. I do not like to start on the back of the pack because traffic on the bridge is crazy. People start the ride riding side by side and blocking everybody else behind them. I think if we all need to ride on only one of the bridge sidewalks perhaps we should also set courtesy rules so we ride on single file and only use the extra space to pass other riders. I was able get a little pass the worse of the randonneuring traffic with the help of my bell and "on your left". Near the top of Camino Alto I was alone and just another supper visible rider ahead, that had to be Jack H. As I got closer I confirmed it was Jack but also start laughing as he had some sort of Police stobe contraption toy atached to the top of his helmet and when I announced myself behind with a "what the heck is that on your helmet!?" He treated me to the punch line of a siren and strobing lights. Just too funny. I thanked him for making getting up so early, worth it. We continued riding together to Fairfax and on the next hill of the day, White Hill. I went a little ahead and right after the top I caught up with Keith B. and then we both rode to Samuel P Taylor where a larger group of riders joined us. Bryan C., Gabe E., Andy S. and John P. where there. We all got to the secret control at about the same time and I took the opportunity to get cash out of my wallet and give it to Keith. He had told me earlier his credit card and cash were back in his car in San Francisco. 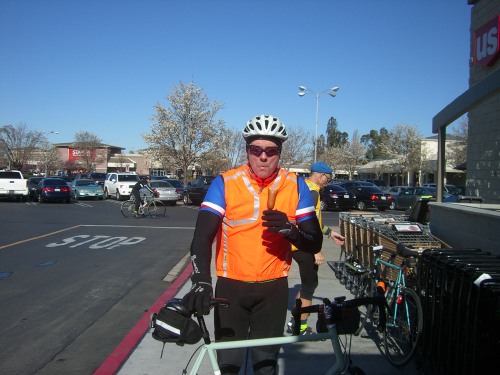 We all rode together to The first Control in the Petaluma Safeway. They had moved the store a few doors down the road on the same strip mall and I was completely loss looking for the restroom. It turned out the bathroom is now in the front of the store not towards the back like it used to be on the old location. After getting a receipt I was ready to go. 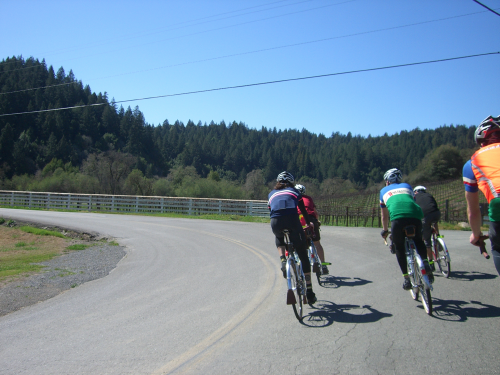 A pretty large group of riders left and we slowly moved towards Santa Rosa and then Healdsburg. We had enough riders to take turns at the front. I talked to Masa K about the upcoming Fleche event. He is going to be doing the Fleche for the first time this year and had a few questions about rules and strategy. I don't consider myself an authority on RUSA/Randonneuring awkward rules but having done a few Fleche events I gave him my oppiniion and assured him, he and his team would have a great time. The Fleche and her shorter brother the Dart are very fun team events and Masa and his friends will have a blast. Hope to see them at the end of that event and share some stories. Another Control, this time in Healdsburg. Here we all had lunch; I went for my customary Safeway soup and some gatorade and water. Now the group leaving was smaller but Gabe, Bryan, John and Andy where there so was Brian K., who is usually way ahead of me but today had tire issues that forced him to stop and fix it and also buy an extra tire just in case. Keith and Jesse M. were also there. Mild temperature, low wind and clear sky made for a very nice riding the scenic Westside Rd rollers to hwy 116. Hwy 116 towards the coast, so low on my favorite roads to ride on. Fortunately today I was in great company and we were moving slowly but stadily towards the Hwy 1 on the West. The paceline was moving between 15-17 MPH depending on who was up in front but somewhere pass Guernville Brian and I were alone. I moved to the front and slowed the pace. Bryan, Gabe, Andy and Jack soon joined in the fun. Once we got to Hwy 1 the little headwind we had on Hwy 116 turned into a slight breeze that was blowing from the NorthWest, meaning kindo tailwind. This is a supper scenic 10 miles to Bodega Bay. The road hugs the coast and if you ride the rollers correctly, with the help of the tailwind not much energy is needed to keep moving forward at a good speed. Got to love love Northern California coast. Almost every single piece of outside wall at the Bodega Bay control was claimed by a resting bicycle. I added mine to the exhibition and went straight into the store where they usually have somewhat stale pizza. No slices left and they were just making the next pie. With no time for waiting to put food in my body, I went for a jalapeño corndog, a spicy V8, coconut water and plain water. Love the randonneuring diet. Many of the riders we had seen at the previous controls were there or got there soon after we did. One by one they left and so did we. The same core group but Brian K had already moved on a while back. At the top of the first hill we stopped for about 5-10 minutes to take care of some business. We were in no hurry and had been chatting all day and having a great time. Some long rollers awaited us but we all were familiar with the route so no surprises. There was an unusual amount of traffic on Hwy 1 today. When we got to Valley Ford we made the executive decision of taking the quieter but longer way to Tomales. Middle Rd is a lovely road which turns and climbs sharply and turns more and climbs yet more. A single car went by on that whole stretch and that was when we had stopped for another 10-15 minutes to take the view at the top of the largest climb. 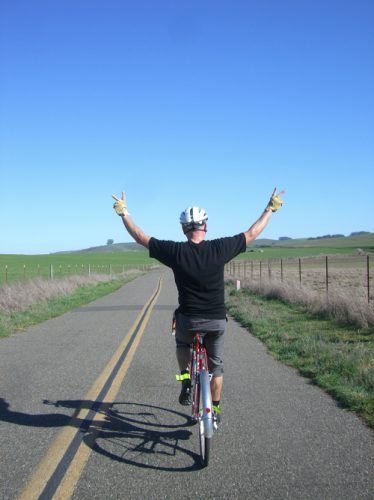 John was bragging of how he could ride no hands or perhaps celebrating yet another uncontested city/county limit sprint. So far we had been goofing all day and having a great time. And then it was the wind tunnel, that dreaded flat but often windy section right after Tomales. I was tired and glad somebody else (Andy I think) was at the front of the paceline. After the wind tunnel it was easy going, I usually can ride set of rollers to Marshal very comfortably, tired but comfortable. At the Marshal store we all got something to drink, stamped our cards and left a tip in the jar. I also drank my third Ensure of the day. Ah the benefit and immediate reward of plastic food! Slowly we started moving towards San Francisco. Thinking already of what was going to be dinner, I figured pizza and a beer would do. 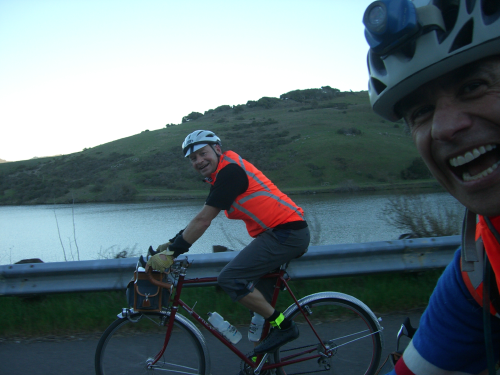 After climbing to the Nicasio reservoir on Point Reyes Petaluma Rd we stopped yet once more to get ready for night riding. 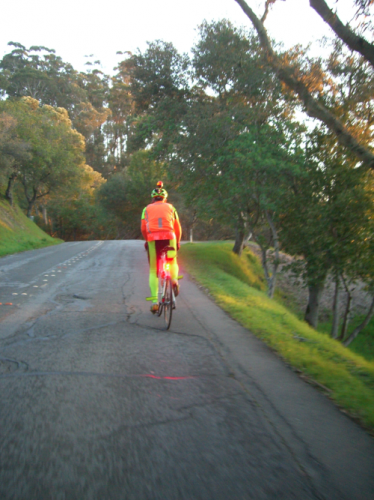 Around Nicasio it was time to turn on my headlight, the taillight was on since somewhere before Platform Bridge. Bryan, Andy and Gabe climbed ahead, I follow and then Jack and John. At the top of the hill before dropping into the San Geronimo Valley we stopped and regrouped, chated some more, took care of private business and then we were good to go again. On the descend we got split into two groups but with the help of Jack, Gabe and I connected with the others before White Hill where again we got separated. Traffic was not bad on this section and on the descend into Fairfax not a single car was behind me. By the town of Ross we were one happy group again. Gabe needed to stop for something so we all did and I took the opportunity open the next package of gel blocks so it would be ready when I needed it. Camino Alto was just ahead and deserved a couple of those blocks. One more regroup at the Mill Valley side of Camino Alto and then the final stretch to Sausalito. John said something about bonking so at the next stop light I gave him a gel, I wanted to spare us all from having to deal with a Mr Cranky in bonking state. "Hey let's stop at the 7/11 ahead to get some beer for the end" John said, I guess the gel had done its magic. Bryan and John each got a six pack while Jack reinstalled his strobing helmet light and tried to decide the most appropiate tune to play when reaching the final control. I think tune number 4 was the chosen one, weeee waaaa, weeee waaaa instead of the more glentler weee, weee, weee, weee!. One last hill to go. At the entrance to the Golden Gate Bridge East sidewalk we waited for Jack and John and then crossed the span and climb the last two blocks to the Final Control at exactly 8:30pm. 14:30 hrs not a fast time for me for this route but it was sure a fun group to ride with. John handed me a beer and riders who were there just before us and after us also got one, spreading randonneuring love. "So who's going for pizza at the place by the Presidio's Lombard Gate?" Gabe, John and I rode on for pizza and a beer, Bryan joined us for the beer but had to leave a little earlier. I made it home at around 10:30, the dog was jumping like crazy happy to see me. I was happy to be home too. Yes Rick, the bridge has had that policy for a long time. However it is one of those rules that gets enforced very rarely and not much at 6am on a Saturday. It makes sense to stick to te rules as a club just to keep the goodwill on our side but we did start our rides for years using the East sidewalk so a sudden change was surprising to me. 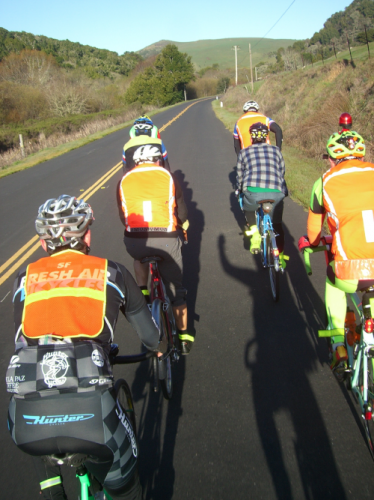 Every weekend when I return from my rides on Marin I see plenty of riders on the East side, at that time of the day I always take the West side. On my early ride starts if I am going down to Sausalito instead of going up Conzelman, I take the East sidewalk; it is shorter and there are barely any users on the bridge at that time of day. What a great ride report! Thanks for sharing. It sounds like Rob and the sign were correct. During the day on weekends bikes are to be on the west side.